In 1983, a Chinese fast-food restaurant in Pasadena, California hired a curious-looking pair of servers: two robots named Tanbo R-1 and Tanbo R-2. At 4.5 feet tall and 180 pounds, the robots would scoot around; bringing trays of chow mein, spareribs and fortune cookies to customers' tables. 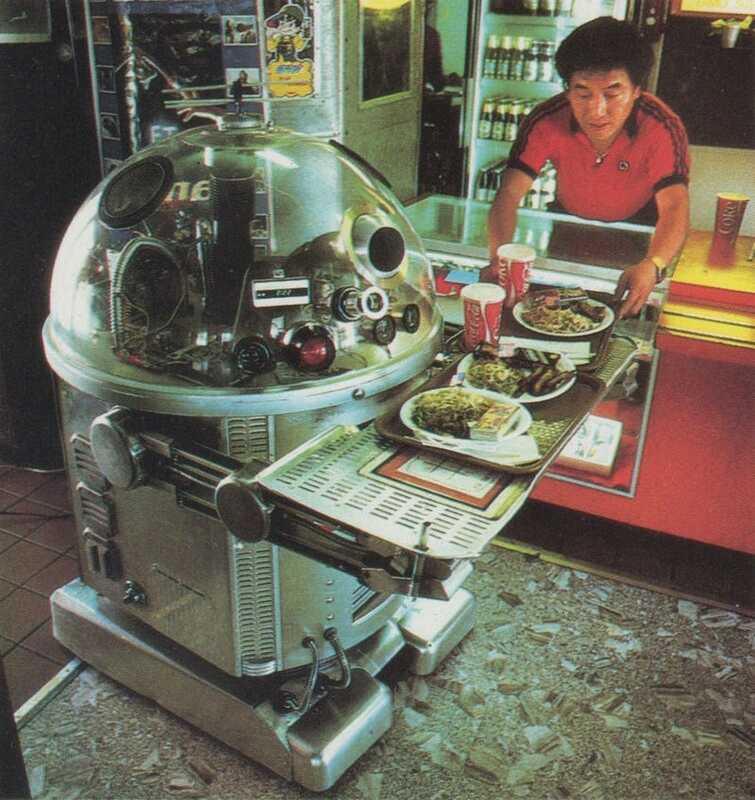 Shayne Hayashi, the owner of Two Panda Deli, first put the robots to work in 1983. Each Japanese-built robot purportedly cost $20,000 (about $45,000 adjusted for inflation) but were prone to dropping things and letting radio interference make them go a bit haywire. When they worked, they were a hit, telling jokes and delivering food to customers who were assured that this would be the future of the restaurant business. The pair at the Two Panda Deli, a fast-food Chinese eatery in Pasadena, tend to blur their words drunkenly when their 12-volt power cells run down, and they've been known to drop food and spin in circles when police radios operate nearby. They're programmed to be nice to customers — "Will there be anything else?" and "See you tomorrow" — in Japanese, English and Spanish. Patrons whose commands confuse the pair get the response: "That's not my problem," accompanied by a short blast of disco music to which the bubbleheads dance back and forth. "But he couldn't take care of it," Hayashi recounted. "All the time I had to drive out there and fix it." Hayashi wound up buying it back. And how do Tanbos R-1 and R-2 rate as waiters? Hayashi admitted they break down often, and while they can find a table with an order, "when someone crosses in front of it, it stops. Some people move a chair or something or move the table, and we're in trouble." With the meteoric rise of increasingly complex home electronics and personal computers in the 1980s, the robot-servant world of the Jetsons and Rosey the robot maid was thought to be just around the corner. And though today restaurants around the world do employ robots in various forms, the fully-automated robot waiter is still relegated to the scrap-heap of paleofutures.